The US food and drug administration has recently issued an alert regarding the high risk of dangers of eating or consuming liquid nitrogen in the form of food. Eating food such as ice cream, cereals, and cocktails that have liquid nitrogen can cause tremendous injury, such as internal organ damage, etc., as stated by the US food and drug administration. When you inhale the vapour that is released by the liquid nitrogen with food or drink can cause breathing difficulty especially among the people who have asthma. 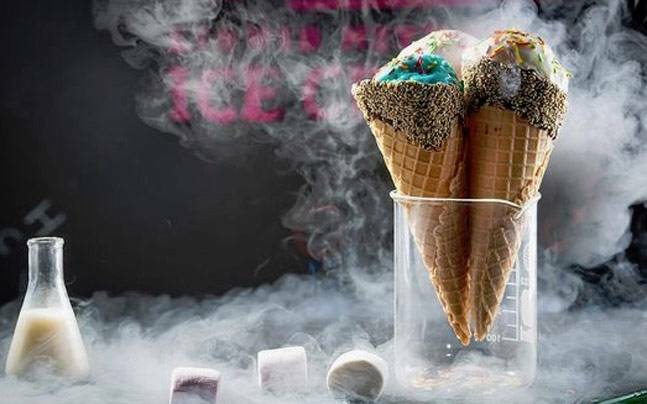 The food and drinks that are prepared with the help of liquid Nitrogen are generally sold in malls, food courts, kiosks, and other retail outlets. The experts advise you to stay away from these food products because they include liquid nitrogen infused colourful serial or cheese puffs that emit a misty or smoke-like vapour that can put your health in dangerous especially if you have bleeding disorders. These food products are generally marketed under the names dragon’s breath, heaven’s breath, nitro puff, and various other similar names. The US food and drug administration has become aware of the serious and in some cases life-threatening condition skin damage, internal organ damage that is caused by liquid nitrogen present in the food or drink. That have been reports in the hospital that say the patient has been admitted because of breathing difficulty after inhaling the vapour released by liquid nitrogen that adds up after consumption of the food product made out of liquid nitrogen. There have been reports where the patients have experienced injuries while handling or eating products that are prepared by adding liquid nitrogen immediately after consumption, even after the liquid nitrogen has been evaporated completely due to the extremely low temperature of the food products. If you think you have suffered from injuries after eating liquid nitrogen, you need to consult your doctor as soon as possible to get the health checking done. Liquid nitrogen is a colourless and odourless gas that is found in a liquid state. According to the experts, liquid nitrogen can be unsafe if it is used with ignorance but if you use it in the right way with the right technique, there may be no harm caused either to the chef or the customer. This is the main reason why it is important that the chef and the customers at the restaurants should be aware of the uses and effects of liquid nitrogen before considering things. Next articleDoes India’s Healthcare Industry Require a Security health check?